Alamid Cafe - Kalinga Alamid coffee is one of the rarest, most sought-after coffees in the world. "The palm civet, which is known as an alamid or musang in the Philippines, is a nocturnal catlike creature which is related to the mongoose family. The civets roam freely among the coffee trees, where they dine as often as possible on their favorite food-coffee cherries. Our friend the civet doesn't eat just any coffee cherry but has a knack for choosing the ripest and sweetest of the Arabica, Liberica, Exelsa and Robusta beans, thus creating the finest of natural blends. A fermentation process takes place in the digestive tract of the civet, where stomach enzymes break down proteins in the coffee beans and they are then excreted whole. The Kalinga natives collect the civet droppings by hand in the wild. They are then washed in pure spring water and sun-dried in the fresh mountain air. No pesticides or chemicals are used." Batdorf and Bronson Coffee Roasters - Handcrafting the fine coffees from around the globe since 1986. Offers Certified Organic, Fair Trade Certified and Bird-Friendly, Shade Grown coffees. Benjamin Press - Publishing division of Elmwood Inn Fine Teas. Benjamin Press is dedicated to being America's leading publisher of tea media. Black Gold - Multinational coffee companies rule shopping malls and supermarkets and dominate the $80-billion-plus coffee industry. But while Americans continue to pay for luxury lattes and cappuccinos, the prices paid to coffee farmers remain so low that many have been forced to abandon their fields. Black Gold tells the complex story behind an attempt to make globalization work for the producers of the second most valuable traded commodity for developing countries in the world. Blue Bottle Coffee - Microroasters of organic and shade grown coffee. Locations in Oakland and San Francisco, California, and in NYC and Brooklyn, New York. Caffè Umbria - A full-service, wholesale coffee roaster based in Seattle, Washington. But the family's roots in roasting go back to the 1940's, when Ornello Bizzarri built his roastery in Perugia, Italy. Coffee Alamid - Philippine Civet Coffee from wild civet droppings on the different forest floors of Philippine mountains. The Paradoxorus Philippinensis is a civet which belongs to the mongoose family - a nocturnal animal which uses its nose to choose the ripest and sweetest coffee cherries and relentlessly eats them during coffee season. Gathered very early in the morning usually before the sun rises, the forest dwellers climb the mountain and pick the civet droppings on the forest floors. On a good day, a gatherer can collect one kilo of civet droppings. Coffea arabica (Wikipedia) - A species of coffee indigenous to Ethiopia and Yemen. It is also known as the "coffee shrub of Arabia", "mountain coffee" or "arabica coffee". Coffea arabica is believed to be the first species of coffee to be cultivated, being grown in southwest Arabia for well over 1,000 years. It is considered to produce better coffee than the other major commercially grown coffee species, Coffea canephora (robusta). Coffee and Conservation - Provides information about the connection between coffee and the environment -- especially bird habitat. CoffeeGeek - News, reviews, opinion and community for coffee and espresso. CoffeeResearch.org - Founded in 1999, CoffeeResearch.org was the first Web site dedicated to coffee education with comprehensive coverage on coffee, espresso, coffee brewing, coffee agriculture, coffee science, and the coffee markets. Its research is the culimination of a year of travel studying coffee with the foremost experts around the world. Community Coffee Company - New Orleans coffee, arabica, private reserve, flavored coffee. Frieling - Specializing in coffeemakers, coffee grinders, coffee pots, espresso machines, cappuccino machines, commercial espresso machines, espresso makers, coffee, coffee maker, and espresso machines. Gavina Gourmet Coffee - A leading gourmet coffee brand in Southern California. 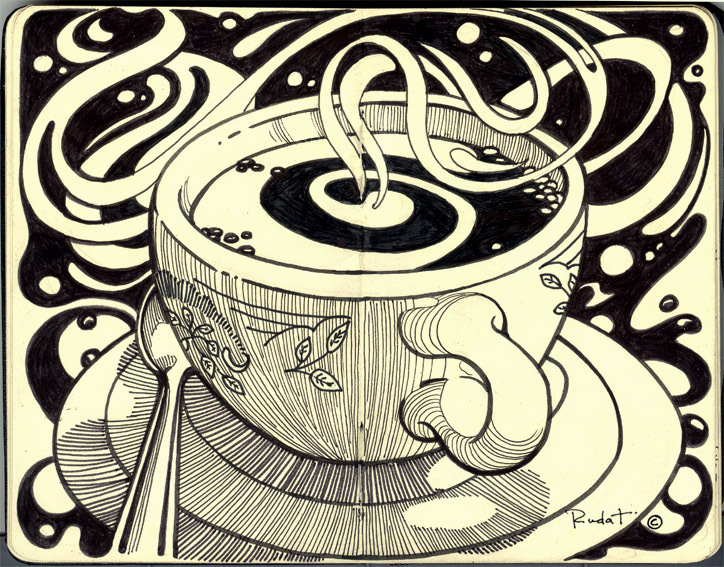 God Shot - Musings from an (ex)professional barista. Graffeo - One of North America's oldest artisan coffee roasters and remains a family-run company passed on down through generations. Founded in 1935 on the streets of San Francisco's Italian culinary capital, North Beach. How to Use a Press Pot - If you want some of the richest coffee you can get, a press pot can deliver. What may surprise most is that you can also get a relatively clean brew from it as well, if you have the right tools and prep everything correctly. 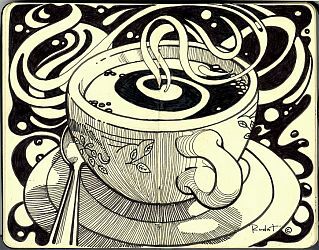 I Need Coffee - Articles on coffee: brewing, history, culture. Also see French Press Coffee article. Infinity Conical Burr Grinder - Computer controlled special grinding heads cut the angles and shapes of the steel burrs to within 0.1 mm precision (1/250 of one inch). Burrs are produced as matched pairs and are hand assembled in Switzerland for precise fit. The multiple gear motor produces the slowest grinding action (< 450 rpm) resulting in highest precision grinding from Turkish fine to percolator coarse. Lowest noise conical burr grinder. Intelligentsia Coffee and Tea - Intelligentsia Coffee's mission is to provide our customers, staff, and community with an unparalleled and complete coffee and tea experience in an environment steeped in understanding, knowledge, skill, service and mutual respect." Coffee roaster started by San Francisco refugees on Chicago's North Side. Just Coffee Co-op - Practices Fair Trade as a long-term partnership between farmers and roasters, including pre-financing, sharing information and working together for higher quality coffee. Jura Capresso - In 1994, Capresso was launched by Michael Kramm, former president of Krups USA, to serve a specific purpose: to provide innovative coffee and espresso machines for those who want the best. After popularizing high-end coffee makers and the home espresso market for more than 20 years it was time to develop machines which cater to the sophisticated American coffee connoisseur. Koffee Klatch, The - San Luis Obispo County's first, foremost and complete coffees and teas specialty retailer, with a combined experience of over 60 years in this business, answers your questions concerning coffee beans, teas, brewing equipment, imported products and accessories. Krups USA - Blenders, beertender, coffee grinders, coffee machines, nescafe dolce gusto, electric kettles, espresso machines, rice & egg cookers, sandwich - panini makers, toaster ovens, toasters, waffle makers. Native Jack - Nitro coffee, infused with brain function Omega 3 oils and 200mg of caffeine. Nespresso - Coffee and expresso machines. Also see Nespresso-compatible coffee pods at Toast Coffee. Peerless Coffee and Tea - With more than 125 different types of coffee to choose from including varietals, estate coffees, organics and flavored beans, we work hard to create the perfect coffee experience. Along with itd award winning coffees, Peerless offers a full line of gourmet teas hand selected from premier tea growing regions around the world. Adam Teitelbaum established Adam's Organic Coffees in San Francisco, California in 1992 as one of the first all-organic coffee companies. In 2002, Adam's Organic Coffees became part of the Peerless Coffee and Tea Company family and Teitelbaum heads up the Adam's Organic Coffees Division at Peerless. Philz Coffee - Philz Coffee in San Francisco has developed a devoted following, and for good reason. The twenty blends that are now available by the pound are the result of 25 years of coffee alchemy and invention. Roger's Gourmet Coffee and Tea Market - A unique company that grows, imports, and roasts its own coffee, and has a deep commitment to social and environmental responsibility. Rusty's Hawaiian - All coffee grown in the Ka'u District, an award-winning coffee region on the Big Island of Hawaii. Specialty Coffee Association of America (SCAA) - The SCAA was formed in 1982 by a small group of coffee professionals seeking a common forum to discuss issues and set quality standards for the specialty coffee trade. Today, it is the world's largest coffee trade association with nearly 3,000 company members. Although most of its members are located in the United States, they are involved in coffee production, roasting and brewing all over the world. International members include producers, retailers, roasters, importers and exporters from 40 countries. Stumptown Coffee Roasters - Independent coffee company with locations in Portland, Seattle, and New York City. Tea Association of the United States - Industry trade group. TeaChat - English language forum dedicated to the discussion of tea and all other related items; teaware, tearooms, ready-to-drink, tea and food. Technivorm Moccamaster Coffeemakers - These coffee makers are all handmade, which means that they are manufactured and assembled by hand and individually tested in a live situation. It is the personal touch that makes our products unique. Three Avocados - A non-profit coffee company whose net proceeds provide clean water in Uganda. This webpage last updated on Sunday, July 23, 2017 5:54 PM.